The Survey of India would soon “re-measure” the height of Mount Everest to clarify doubts expressed over it in some sections of the scientific community following the major earthquake in Nepal two years ago and to help scientific studies, surveyor general of India Swarna Subba Rao said. “We are sending an expedition to Mount Everest. Everest height was declared, if I remember correctly, in 1855. Many others also measured it. But height given by Survey of India, even today, is taken as the correct height. It is 29,028 ft. We are re-measuring it. Two years have passed since the major Nepal earthquake. After that, there is a doubt in the scientific community that it is shrinking. That is one of the reasons. Second reason is, it helps in scientific studies, plate movements etc,” he said. All the necessary approvals have been obtained for the expedition and the effort should begin in a month, he said on the sidelines of a meeting of Geospatial World Forum. “I have got all the approvals. If the Surveyor General of Nepal has come here (for the conference in Hyderabad), I will have a meeting with him. 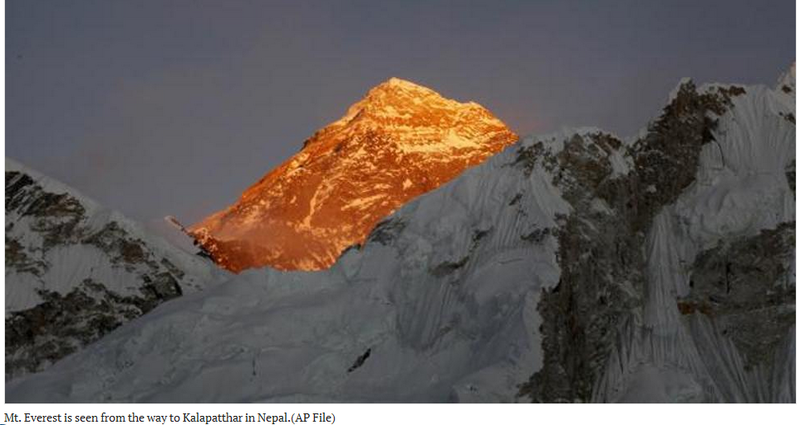 As I see it, we plan to send (the expedition team) in two months,” he said. The endeavour would take about a month for observation and another 15 days for computation and declaration of data, Subba Rao said.